Jerusalem - A Jerusalem rabbi is leading an effort to have a new holiday added to the Jewish calendar, a day dedicated to resolving conflicts constructively and to actively pursuing peace. Rabbi Daniel Roth, director of the Pardes Center for Judaism and Conflict Resolution, a division of the Pardes Institute for Jewish Studies, has dedicated the 9th day of Adar as a day to promote machlokes l’sheym shomayim, managing disputes in a healthy and positive manner. “Conflict is inevitable and a part of every page of gemara, where Rashi and Tosfos can go on forever, as well as in halacha and Chumash,” Rabbi Roth told VIN News. Rabbi Roth, who is originally from Syracuse but now lives in Jerusalem, has a doctorate from Bar Ilan University on the concept of “rodfei shalom”, community members who took it upon themselves to mediate disputes. Rabbi Roth’s quest to publicize the notion of constructive conflict resolution within the realms of Judaism originally began as a single course on the subject given at the Pardes Institute, which integrated traditional rabbinic texts with contemporary conflict resolution theory. Over time, the subject matter grew and the Pardes Center for Judaism and Conflict Resolution was created two years ago with the goal of fostering unity worldwide by creating a global network of rodfei shalom. At Englewood’s Moriah School, the PCJCR program has been incorporated into this year’s curriculum. According to reports in The Jewish Week, Moriah’s Assistant Principal, Student Life, Dr. Eva Lazar-Sultanik, spent last summer studying conflict resolution at Pardes. “We are committed to creating and sustaining a school culture which promotes the value of seeking peace,” said Dr. Lazar-Sultanik, who noted that the Rodef Shalom program is being well received by the students. Dr. Lazar-Sultanik planned several 9th of Adar programs for Moriah’s middle school. “Throughout the month of Adar we will be engaging in various school-wide programs learning conflict resolution skills; it will all lead up to a culminating parent-child learning program,” reported Dr. Lazar-Sultanik. The PCJCR also offers online mini courses for upcoming rodfei shalom as well as workshops for Jewish community leaders and a special group of courses for Jewish educators and rabbinic students. 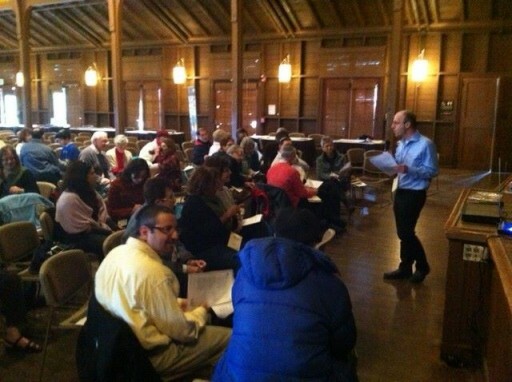 Mini courses on becoming a rodef shalom are also offered throughout the year at various locations. Searching for a day that had religious significance but was currently unassociated with any other movement or activities, Rabbi Roth chose the 9th day of Adar, a little known fast day that is brought down in the Shulchan Aruch as Tzom Hillel V’Shammai. According to Rabbi Roth, the events of the 9th of Adar were so tragic that the Gemara in Shabbos likened it to the day the egel was made. According to Rabbi Yair Hoffman who is a frequent author on Halacha, the significance of the day is even greater, as it forever undermined the scope of Torah study. Given the significance of the 9th of Adar, it seemed an appropriate day to dedicate to constructive conflict resolution and the PCJCR came up with eighteen ways to commemorate the day, corresponding to the 18 legal matters that caused the initial conflict. Among the suggested ways of marking the 9th of Adar are fasting, refraining from destructive speech, giving tzedaka and praying. An official website 9th of Adar website, www.9adar.org, has recipes for symbolic foods to mark the day, including Machloket Muffins and Constructive Conflict Cookies. “Pesach wouldn’t be Pesach without our symbolic foods and much of the original conflict was actually over food,” explained Rabbi Roth, who added that children might better grasp the concepts being discussed with the introduction of foods that are in keeping with the theme of the day. Rabbi Hoffman cautioned that adding holidays to the Jewish calendar is no simple matter. While Rabbi Roth is still waiting for feedback on 9th of Adar programs that were held around the world in both secular and chareidi communities, he noted that for many, the notion of addressing conflict from a Jewish perspective will continue, particularly with another month of Adar coming up in just a few weeks. you we are like the goiyem that they need holiday once a year to have hakores hatov (Thanksgiving) or that they should respect their parents (father day or mother day) we are not like that. It's a taanis and he wants to make it a yom tov? Does anyone know if the source for the machloket of Hillel and Shamai were accurate? Were there in fact people killed? Rabbi Hoffman mentioned the Lavush's perush on the Shulchan Aruch, who was sover that the 9th of Adar was because of the first machlokes "shtey torot" (based on Bavli, Sanhedrin 88b). In addition to this I was being somech on the perush of the Eliyah Rabbah (R. Eliyahu Shapiro) who comments on the mechaber there "Bes Shamai and Bes Hillel had a machlkes- 'and 3000 of the students were killed.'" This is most likely based on Yerushalmi Shabbat 1:4 "and Bes Shammai stood below them and were killing the students of Bes Hillel'- see the machlokes between the pney Moshe and the korban Edah there regarding if they actually killed them or not.